Yep. 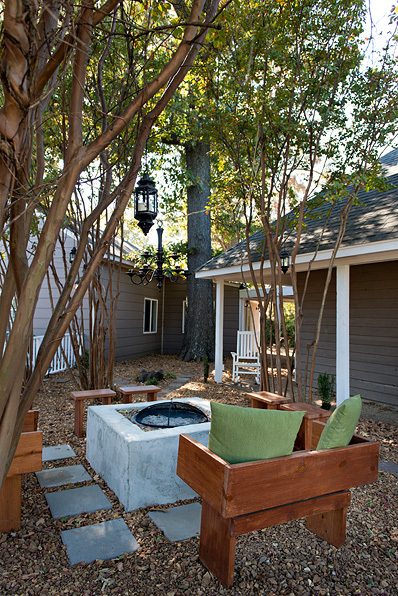 Major change to the side yard!! 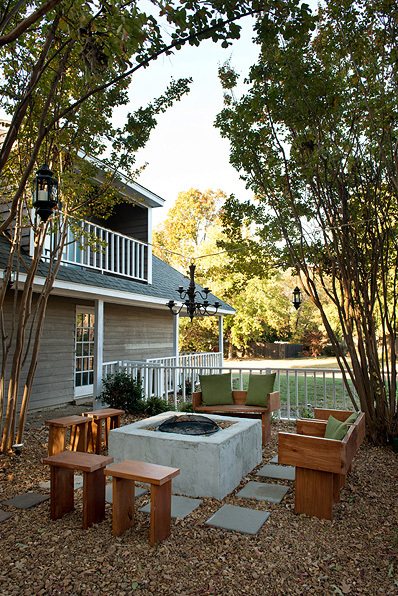 The jungle is officially gone and has been replaced with additional railing, a patio area, and a custom fire pit! 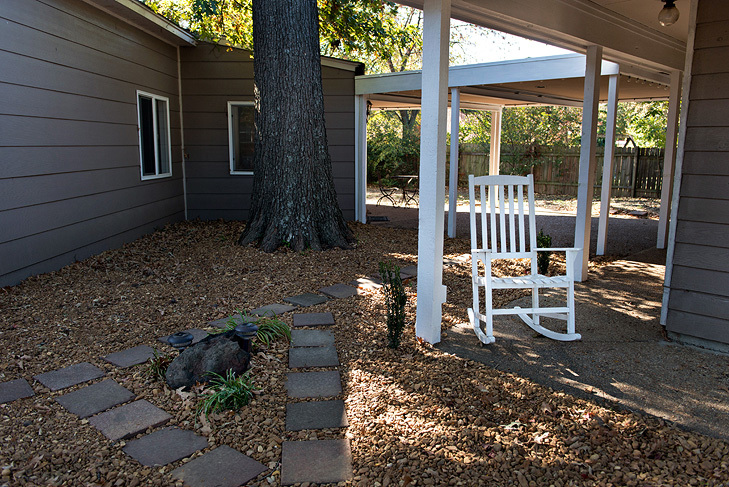 In the previous post I talked about how we cleared out the jungle area and laid down all the gravel. 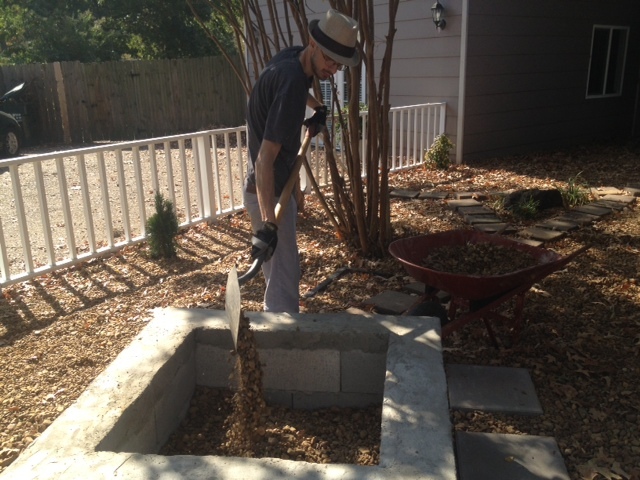 This post will shoe the final project and also how we built our custom fire pit. 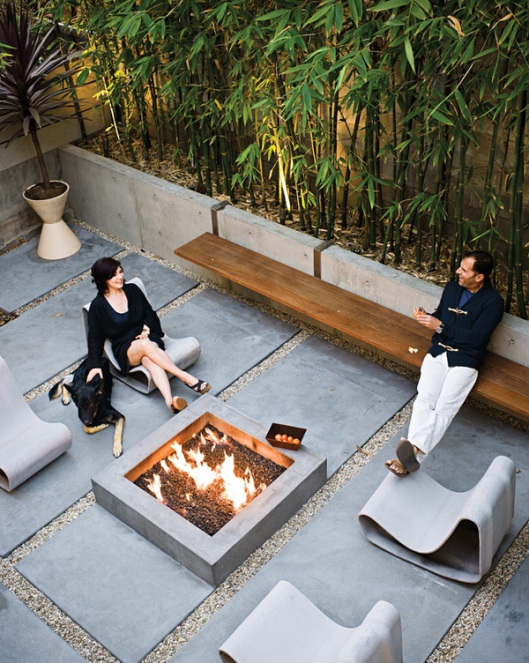 We love the mixture of modern concrete, gravel, warm natural woods, and greenery. 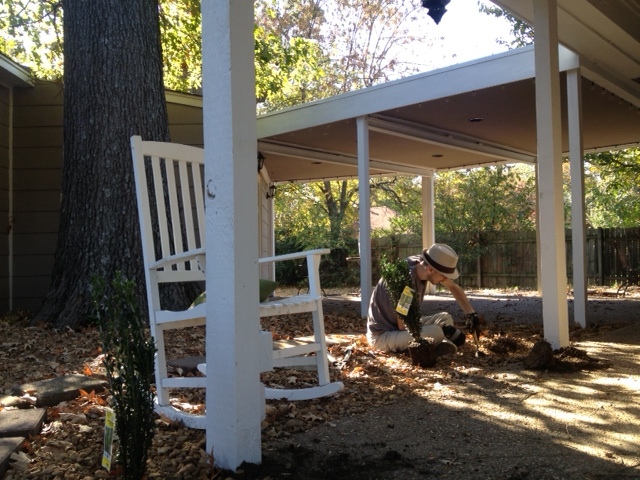 While working on our own yard we decided that the finish style for our place would be Southwestern Modern. We took the inspiration from the above image and adapted it to our own place. 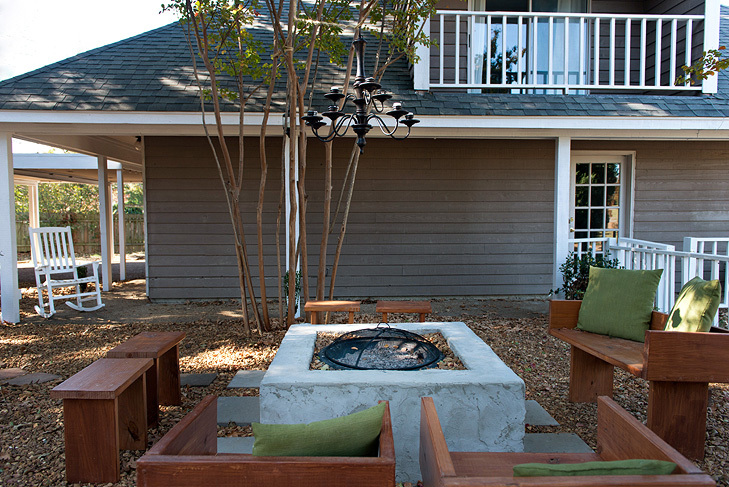 All along we knew we would have a fire pit in the area. We both love fires and sitting around them with friends. What we didn’t care for were the store bought ones. 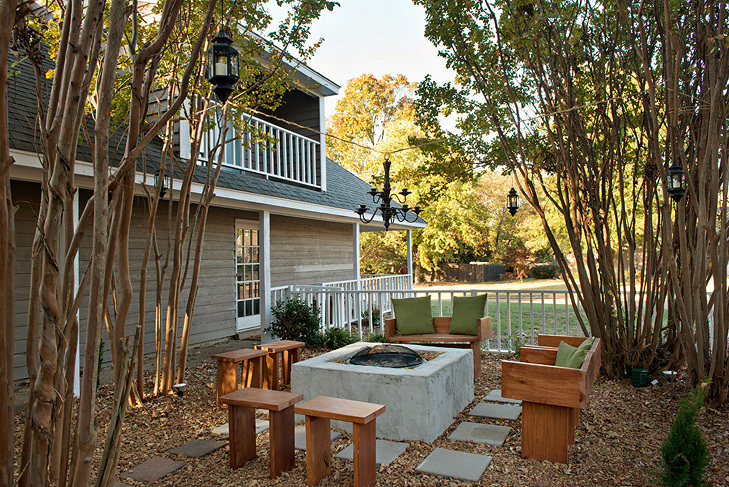 For our personal style we have always be drawn to a more modern look to a fire pit. 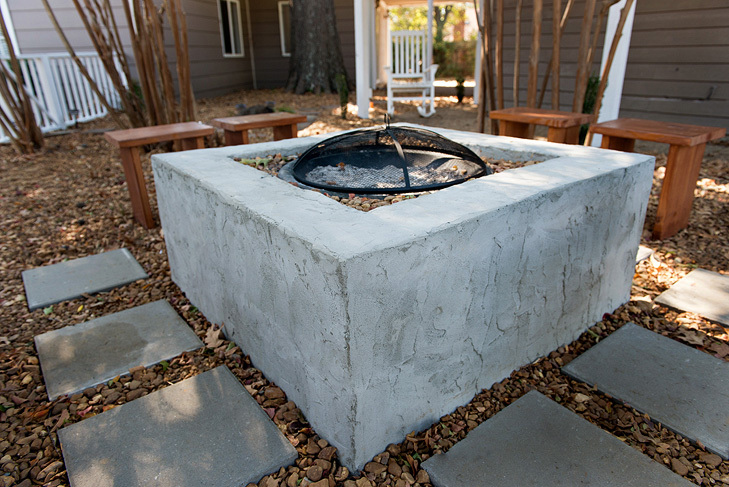 I personally LOVE the square concrete fire pits and had my mind set on one. We started by measuring off the area for the fire pit. 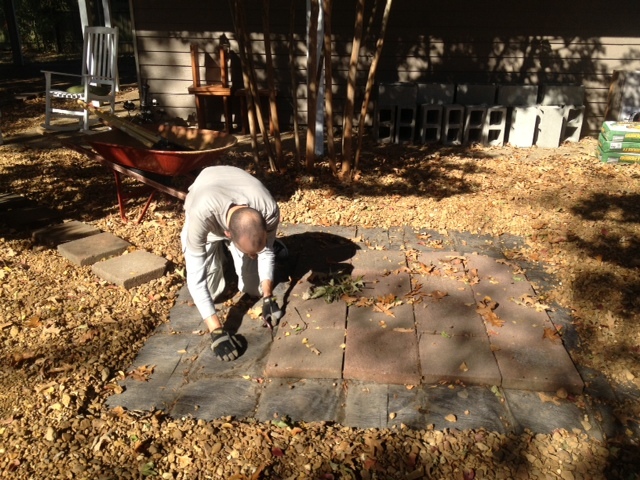 Originally we were going to use the pavers that we found in the area for the patio seating area. 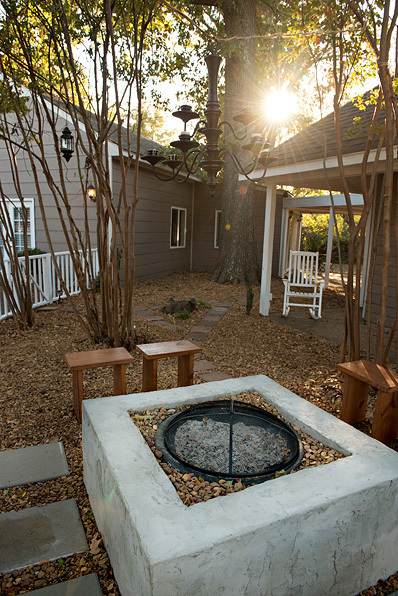 When we decided to go ahead with a large fire pit we took the pavers and made a walk way. 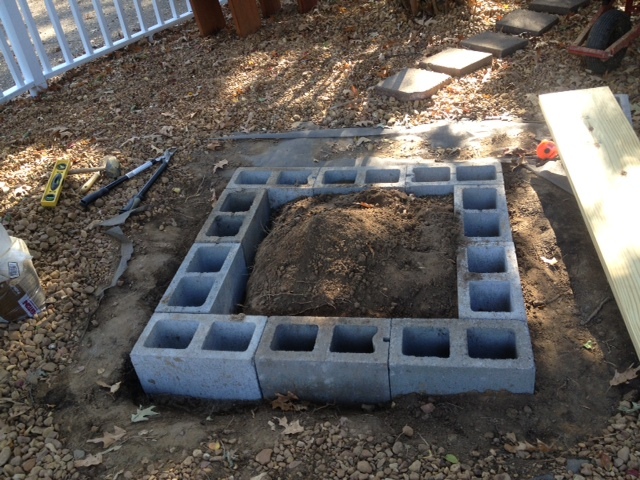 But since the pavers were 12 inches squared they were perfect for getting a visual for the actual size of the pit. Then we dug a six inch trench and placed the first layer of cinder blocks in the trench. At this point we leveled the first layer. It took a full day to dig the trench and level the first row. 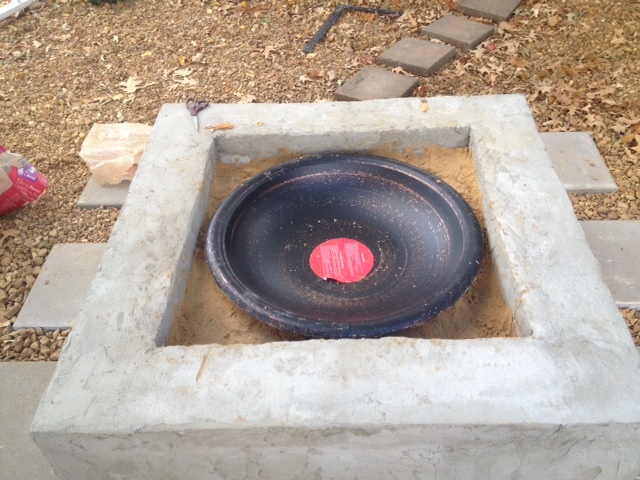 Leveling the first layer is vital for the structural integrity of the fire pit. 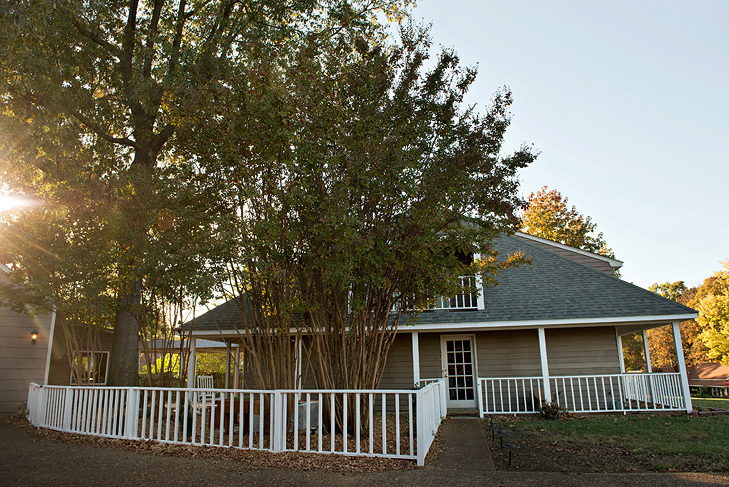 This area is surrounded by crape myrtles and their root system is very intense! Ever shovel full of dirt was full of roots and we were constantly having to stop and chop up roots. 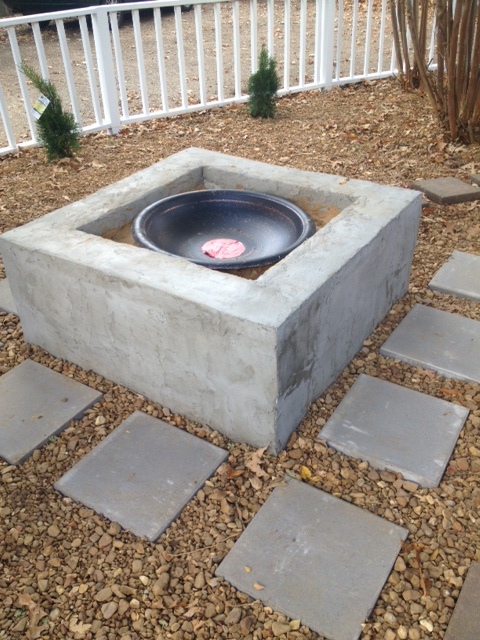 The finished fire pit was made up of three levels of cinder blocks. After leveling the first layer we went ahead and stacked the rest of the blocks on and let them set over night. This allowed the first layer to settle into the trench before we mortared the cinder blocks together. Day two we took the top two levels off and then mortared each block in place. Even with leveling the first layer we stilled had to level as we went on. 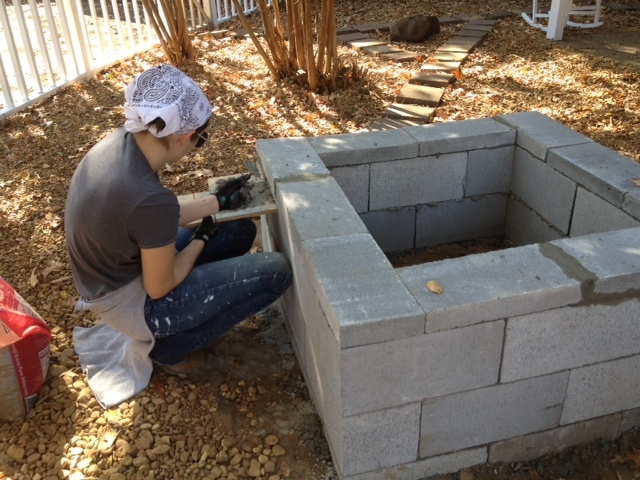 Cinder blocks are not the highest quality of blocks so the individual blocks at times were not level. This is where mortar is very handy; you can add more mortar to help level the block. 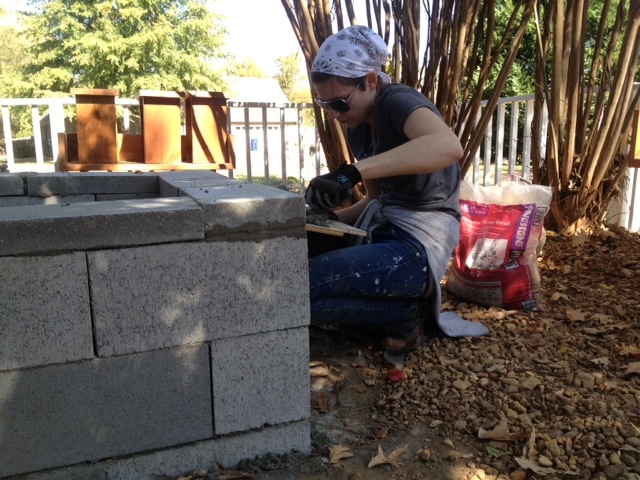 We then let the three layers set for a couple hours and let the mortar dry. We then topped the cinder blocks with 8 x 16 x 1 5/8 cap stones. (We used 10 and they are $1.20 at Home Depot). 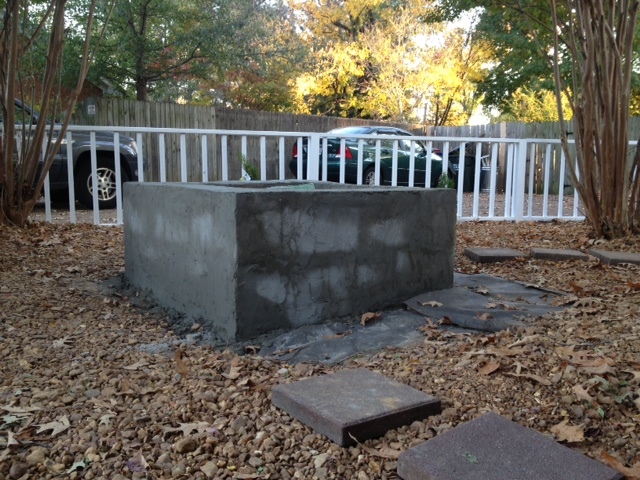 We leveled as we built up but the top layer still was a little uneven when we went to place the cap stones. 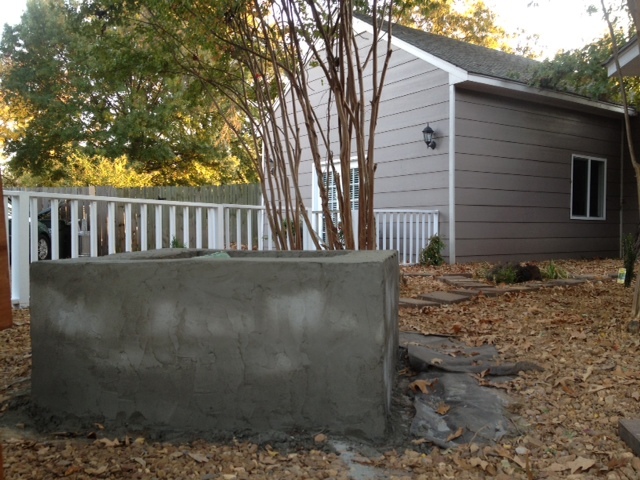 (Reference above image, the far side wall) I used extra mortar to help level out the top. Another view of it drying. One thing I did do was I left a texture in the skim coat. Because we were going with a Southwestern Modern feel I left the mortar looking like stucco rather than sanding it smooth. And finally we place another 4 inches of gravel around the bowl to secure the bowl and help it match the rest of the area. We brought in our old patio furniture that we built last year and hung some lighting. The chandelier over the pit is actually the one that used to hang in the dining room. We replaced it with a more modern one and I stripped this one of its electrics and placed candles in the place of the light bulbs. So here is final look at the area! 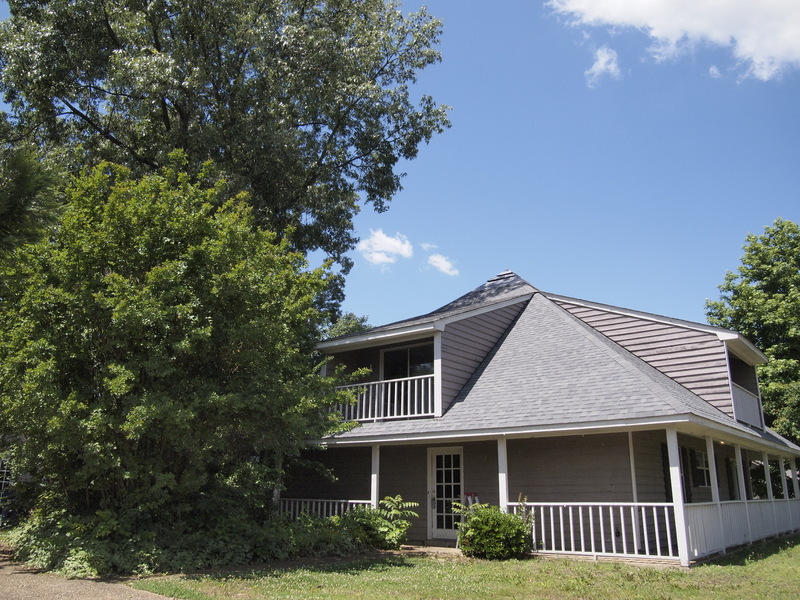 Also you can see that the railing is no longer on the house! 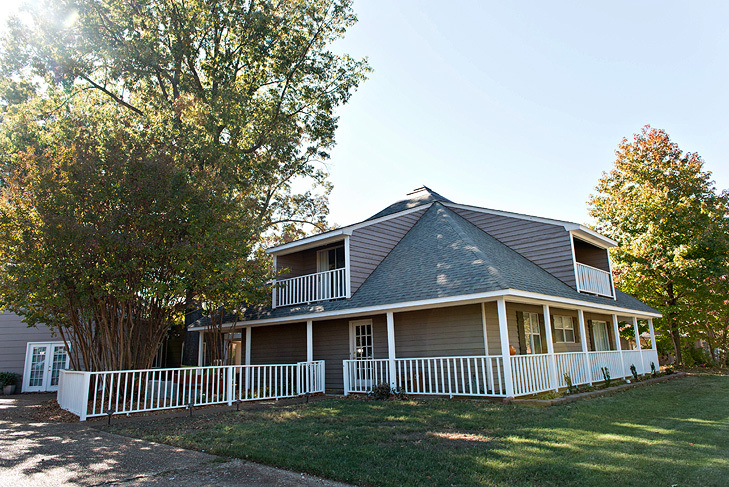 We wanted this new area to flow into the porch and breezeway area so we moved the railing to right next to the driveway. It majorly opened up the area and we love it.